With the onset of autumn weather, brown marmorated stink bugs storm a household. This week we catch up with brown marmorated stink bugs (BMSB), Halyomorpha halys, that will soon make headlines as they seek winter refuge inside homes and businesses. A native of Asia, BMSB first appeared in the United States in the middle 1990’s near Allentown, PA, and are now found in 38 states ranging from coast to coast, border to border, with the epicenter in the middle Atlantic region. How has this bug spread so rapidly? Due to its penchant to hide in sheltered locations to pass the winter, it often invades recreational vehicles and campers. One vacationer reported driving hundreds of miles away from a home in Pennsylvania, opening the camper, and unwittingly releasing BMSB in a new location. In 2009 we heard reports from growers who sustained significant losses to peaches, pears, and apples to stink bugs. 2010 was even worse with regional losses to apples alone exceeding 37 million dollars. This development was particularly disagreeable from a pest management standpoint. Over the past four decades, fruit growers have made enormous progress reducing the amount of pesticides used in orchards by implementing an approach called integrated pest management (IPM). IPM relies on creating an orchard ecosystem that supports natural enemies to help control fruit pests. Pesticides are used only when needed and growers carefully select insecticides that are least disruptive to the ecosystem. Because BMSB have a remarkable reproductive potential and due to the fact that they can be so destructive, growers have been forced to resort to multiple applications of potent, residual insecticides to deal with this threat, thereby reversing years of progress made during the heyday of IPM. Tomato is on the menu for this band of stink bugs. Over the past few years damaging numbers of stink bugs have been seen in soybean fields across the region. 2010 witnessed record numbers of stink bugs in fields of sweet corn. By plunging their sturdy beaks through the corn husk, they can then remove the nutritious contents of developing kernels. In some cases, so many kernels are damaged that the ear of corn actually fails to fill out. 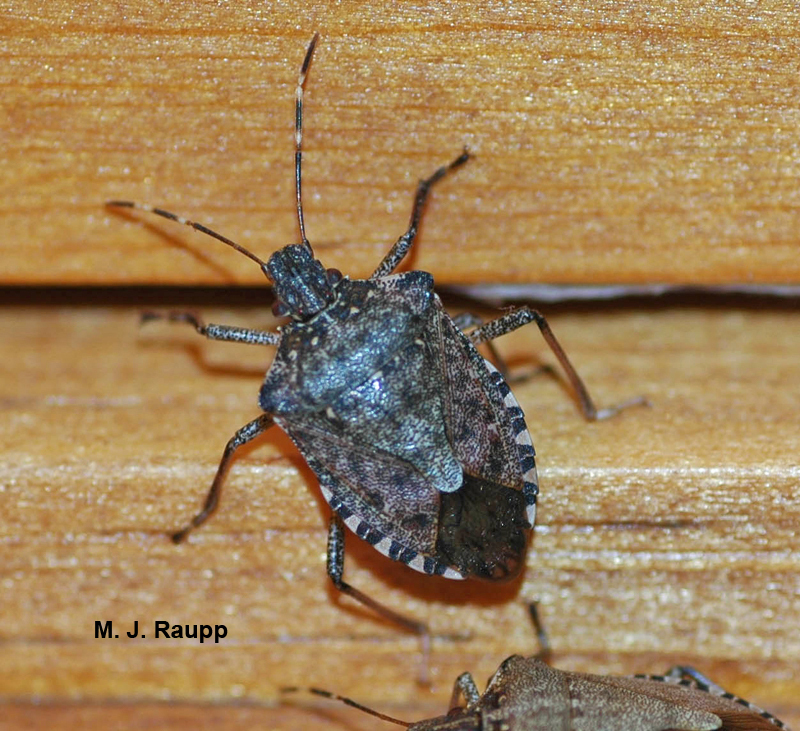 Stink bugs are not just a problem for conventional vegetable growers. With fewer options for insecticidal control, organic vegetable growers in the region have been overwhelmed where stink bugs are common. Community gardeners and homeowners have been vexed when hordes of stink bugs lined up on ripening tomatoes, poked holes in the skin and drained the juicy tissues below, leaving behind speckled, puckered, and pockmarked fruit. Similar injury has been reported on peppers and many other vegetables. While populations of BMSB cropped up in new states in 2011, in general, stink bug populations were lower throughout our region and this trend continued through the spring and summer of 2012. The reasons for this decline have been attributed to weather and greater activity of natural enemies of stink bugs, but the exact cause or causes remain a mystery. 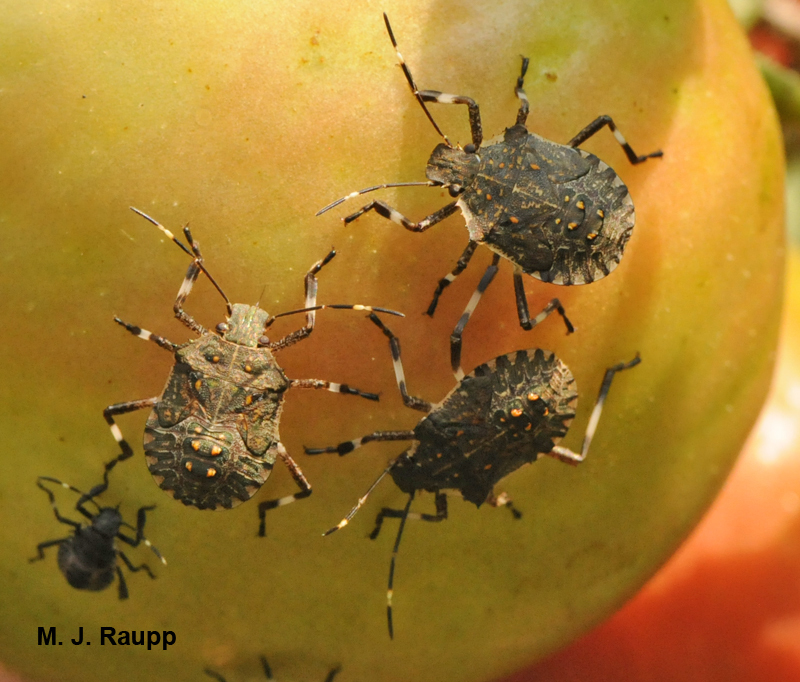 For many viewers of Bug of the Week, stink bugs in apple orchards or corn fields probably seem like a remote problem. However, the nuisance potential of BMSB is almost without equal. In 2011, a homeowner in western Maryland captured more than 26,000 BMSB from January through June as they moved about his home seeking egress from their overwintering refuge. That’s a lot of nuisance! What does the autumn of 2012 hold for BMSB? Unlike the cooler, wetter summer of 2011, 2012 has been a year of record warmth and BMSB completed a full second generation in grand style. On a recent safari to a soybean field in Keedysville, Maryland, I collected hundreds of BMSB in a couple hours of easy picking. Will the home invasion of 2012 resemble that of 2010 and why do stink bugs enter homes and man-made structures in the first place? Many folks incorrectly believe they enter to be warm for the winter. Bear in mind that millions of years ago when BMSB evolved, there were no mansions or man-made structures to invade. In chilly locations where winter halts the growth of deciduous trees and shrubs and withers herbaceous plants, food for the plant-eating stink bug all but disappears. Cold brings movement and development of BMSB to a standstill. During this inimical season, BMSBs seek refuges to chill-out where they are protected from the harsh weather and dangerous predators. Until recently, these natural winter redoubts were thought to be rocky crags and piles of leaf litter. However, a new study revealed that the loose bark of large, freshly deceased but still standing trees may be a prime winter hideout for BMSB. However, for a BMSB leaving a senescing field of soybeans, the siding on a home might look like a mighty fine place to spend the winter. Each day for the past two weeks, I noticed adult stink bugs massing on the sunny side of my house and peeking through the windows. No doubt, these rascals were casing the joint and over the next several weeks they will begin to enter my home in search of a cool protected spot to spend the winter. For all my attempts to caulk, plug, and screen them out, a few will get past my Maginot Line and it will soon be time to break out the vacuum. Will the autumn of 2012 be a repeat of 2010? We will soon find out. Bug of the Week thanks Doo-Hyung Lee, Doug Inkley, Tracy Leskey, Galen Dively, and other members of the BMSB Working Group for providing information and inspiration for this episode.